– You don’t really have to go anywhere for great dog pictures. Some of your best opportunities can be right near home. I was looking for an excuse to do some daylight flash highlighting. With your average wimpy speedlite, this requires an overcast day to pull down the sun’s light a bit. I got my wish when the forecast predicted clouds moving through at mid-morning. I hitched Buzz up, strapped on the dSLR with 14mm f/1.8 lens mounted, and packed up. I was also taking a second 24mm f/1.4 lens, small light stand and the wimpy speedlite with remote trigger. And I had a small foldable softbox to diffuse the light from the speedlite. 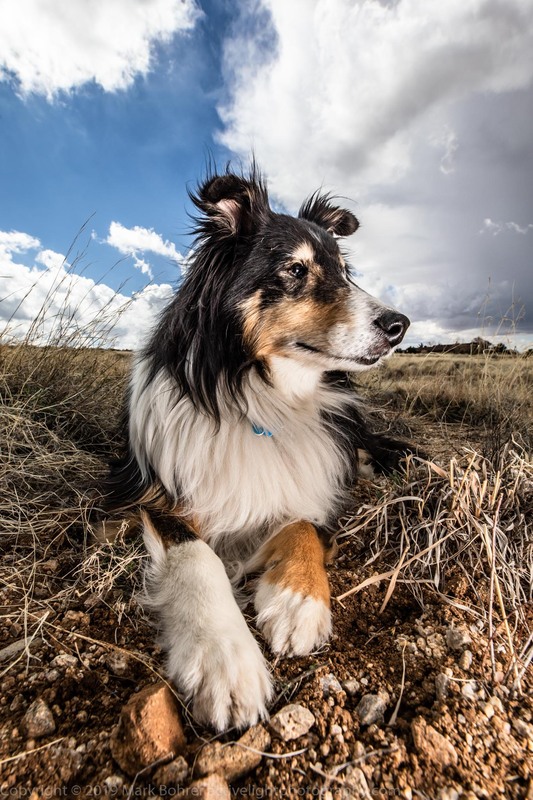 Live in the Albuquerque area with your pup? For a limited time, get a 30 minute pup photo session at your home or location of your choice for $199 $149. This includes professional lighting, one pose, and an 8×10 print. 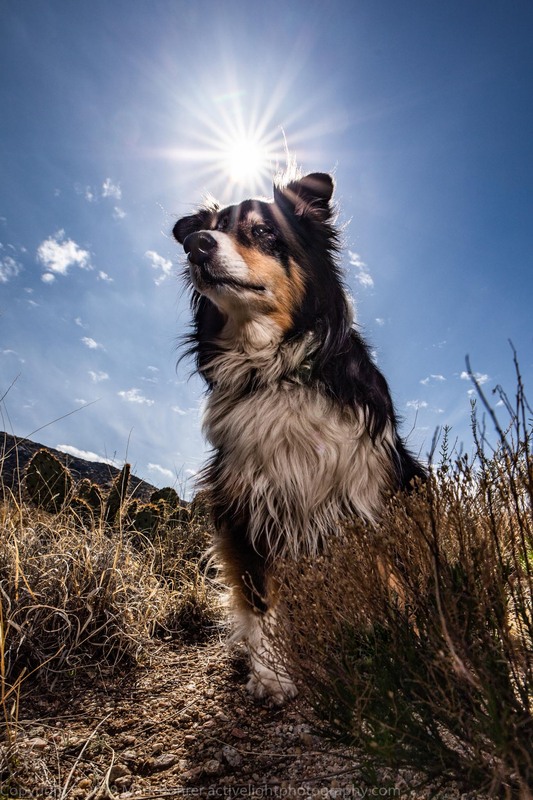 You can even choose to include yourself in the shot as your pup’s co-star. Sound good? Give me a call at (408) 483-3782 and we’ll set it up. Or use the contact form here. But hurry – offer ends May 1. I’d noticed a small rise with the city in the distant background on a previous walk. I thought it might make a nice foreground and background with Buzz as the star of the shot. So off we went to our local trail in the Sandia Foothills. We walked past my favorite bare trees towards a concrete dam that never has any water behind it. The main street near our house parallels an arroyo’s path, so they had to prepare for 100 year floods to keep water out of people’s houses. As I was starting up the path beside the dam, a trail snaked off to my left. There were some scrubby desert weeds and prickly pear on either side, the Sandia Mountains in the background, and hazy light with clouds streaming across the sky, so I stopped. My original thought was to have Buzz sitting or standing with his head blocking the sun for a halo effect. What you realize is you can have the mountain background with a slightly downward view, you can have a hero view looking up at a subject blocking (or almost blocking) the sun and no mountain background, but not both. I started with the slightly downward view plus prickly pear and mountains. But I quickly realized I’d need a lower point of view to put Buzz’s head above the horizon. So I contorted down to ground level and aimed up at Buzz. A dSLR’s live view LCD helps with this, but the viewfinder eyepiece blocks the top of the fixed-in-place LCD on an EOS 5D mk IV. So I roughly framed Buzz against the sky and shot. I moved until I almost had him blocking the sun, and shot that too. I knew I’d gotten a diffraction sunstar above Buzz’s head right off the bat, but I kept shooting. 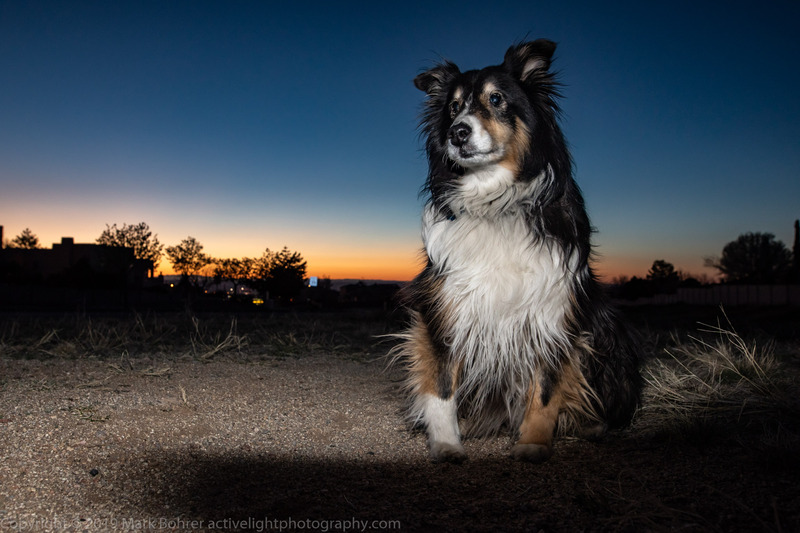 After rolling around in the dirt with the camera for about five more minutes, I folded everything back up and moved on. People in the park must have thought I was crazy. I looked at the spot with the rise and city / distant mountain horizon background… and passed. I don’t know why I thought it was a good spot before – the background view didn’t really cut it. But that happens sometimes. 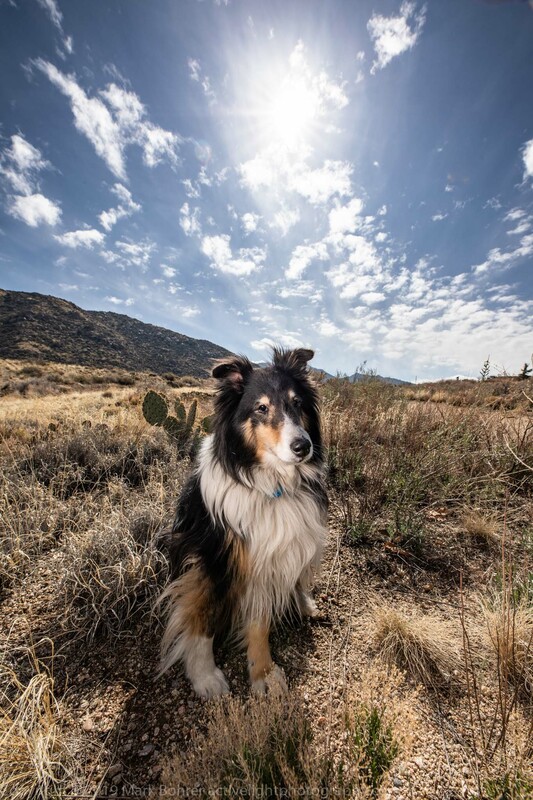 A bit further down the trail, I found another spot I liked much better – great clouds streaming across the sky, a clearer spot for Buzz to pose in, the odd stalk of desert grass poking up in the near background. 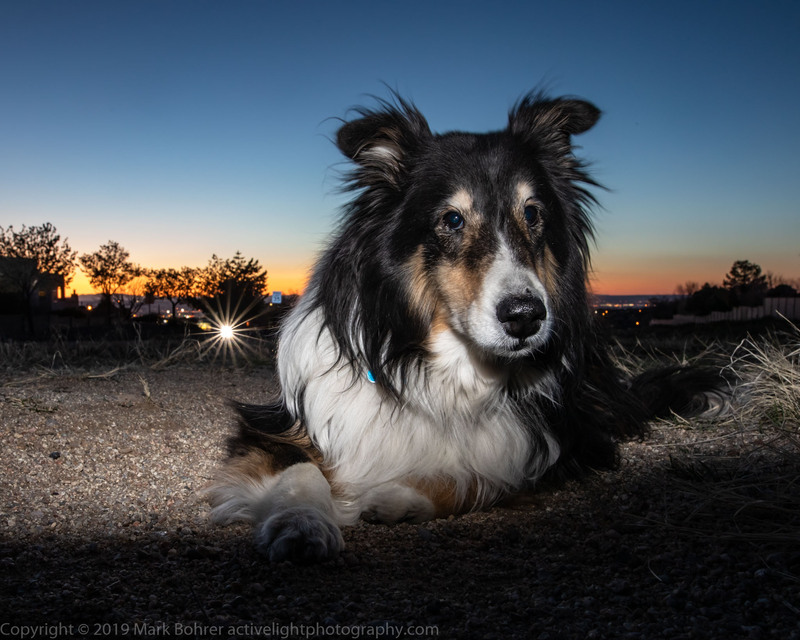 I plopped down the light stand with wimpy speedlite and softbox on top, mounted the remote trigger on the camera’s hot shoe, and positioned Buzz. This time I got down in the dirt right away, since I didn’t really like the background houses and street in the distance. Buzz sat for awhile, but he was tired and eased down early on. 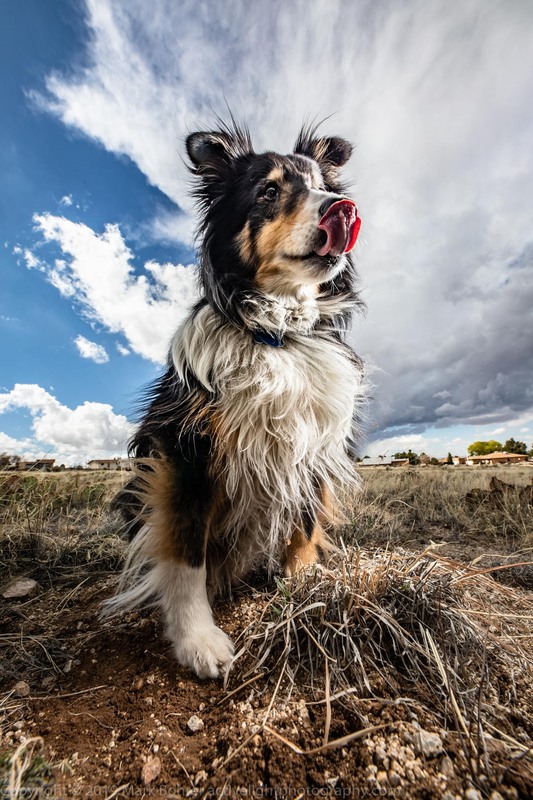 His standing poses gave him a sense of majesty, and he licked his chops in one of them. I’m biased, but he looked commandingly regal in his reclining position too. When I finally glanced up, I noticed clouds and a darkening sky from the southwest (and you can see the approaching clouds in Buzz’s reclining shot). After all, rain had been forecast. So I packed up everything into my camera fanny pack, hitched up Buzz’s leash, and got us out of there. Big fat drops began falling just before we took the last turn into our neighborhood. We were a little damp, but got home OK.
My wife was still out of town, so there was no reason to stay home a couple evenings later. I had hoped for one of New Mexico’s spectacular sunsets for a backdrop, but instead got a boringly-cloudless sunset with just a thin orange line on the western horizon. We went out anyway after dinner, But I was in such a hurry to get out before the light disappeared that I forgot the diffuser for the wimpy speedlite, and the remote trigger. So I was stuck with un-diffused flash in my camera’s hot shoe. Yuck! Thinking fast, I decided I could put the camera in the pocket tripod I HAD remembered, and use my hand to flag the light onto Buzz. There was still enough foreground light to balance the harsh flash into something usable. And I discovered the EOS 5D mk IV’s touch-screen AF shot trigger. The way this works, you simply touch the LCD where you want the AF point. Then the camera focuses there and takes the picture. This left one hand free to shape the flash’s light on Buzz. If you remember Paul McCartney’s 1970s album Band on the Run, it shows McCartney and Wings caught in a spotlight against a brick background. I didn’t have a brick wall, but Buzz looked caught in the spotlight too. Between that interesting light and the limited orange sunset background, I got something I liked. Puppies are a whole different story. 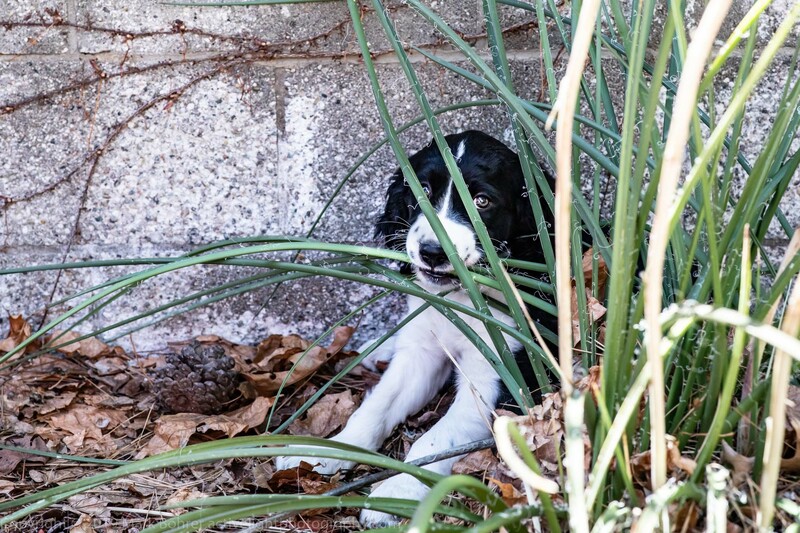 One of our neighbors had just brought home a 10-week-old Springer Spaniel puppy, and wanted to bring her over for a visit. 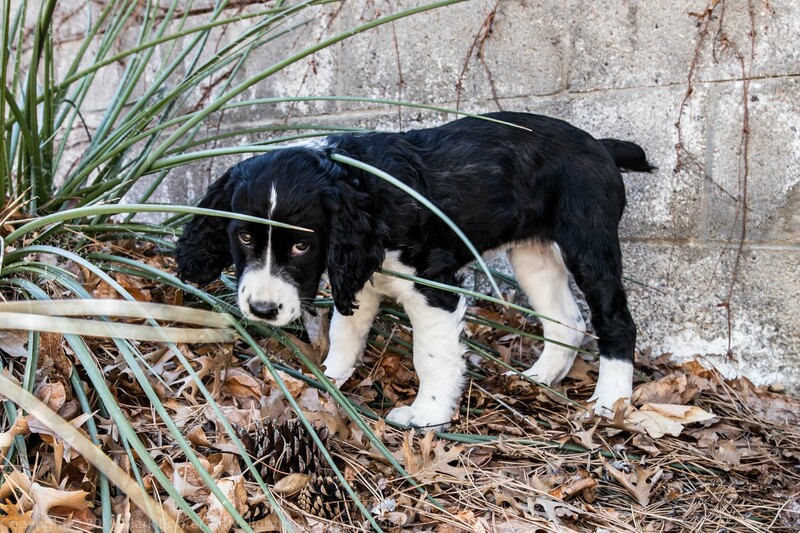 There’s just one thing with young puppies – they can’t stand still. Springer Carly had energy to burn, and rocketed around our back yard as Buzz tried to follow. The usual search for great backgrounds and light placement was out the window with a pup who wouldn’t stay put and couldn’t take direction. I quickly realized I couldn’t stay close enough to use the 14mm very well, so I switched to the 24mm on one camera and used a short 85mm telephoto on the other. This gave me a few good expressions with Carly in the yuccas and chewing them. The shots were all about her big, beautiful eyes and her energy. She did slow down a little towards the end of her visit, making her a tiny bit easier to photograph. 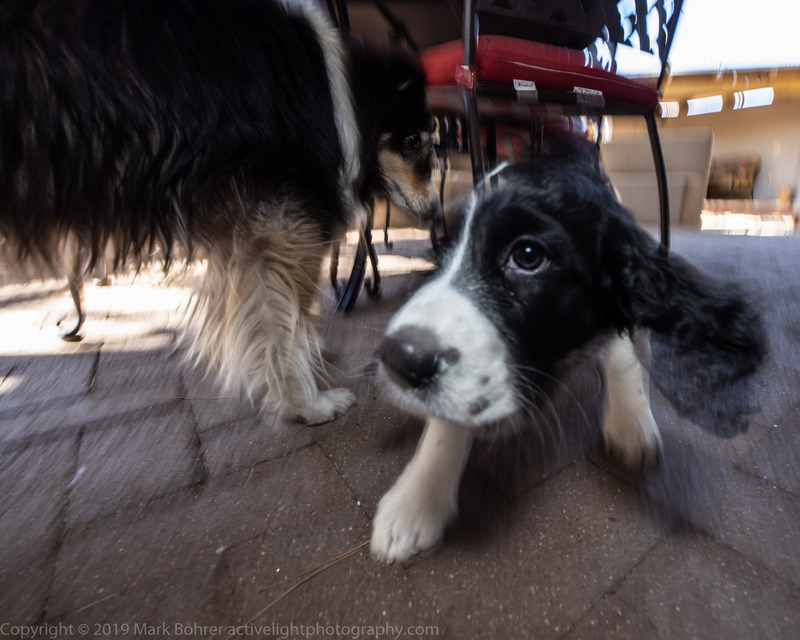 Puppies don’t stay young for long – they can change almost daily – so capturing the all-too-brief slices of their lives while you can is a must. Next time I’ll shoot in a confined space with a more pre-meditated background. But Buzz and I agree, Carly was great fun. I get excited by my four-legged subjects. A few times, I put feet behind grass outcrops, or didn’t capture perfect sharpness on the near eye. I promise it won’t happen again, but Buzz kept giving me these cool expressions in great light. And Carly gave me great action and poses. I caught some intense shots, with compositional or technical perfection occasionally sacrificed. 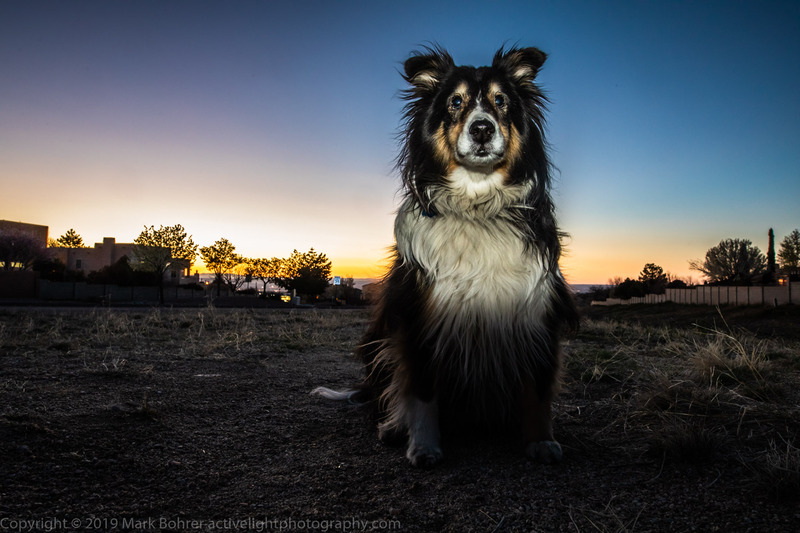 As a wildlife shooter, my mantra was always, “It’s about the behavior, turkey.” That’s also true with dogs. I watched for Carly’s huge, gorgeous eyes so I could feature them in pictures – for me, they were her star attraction. She’s sure to break human and canine hearts.